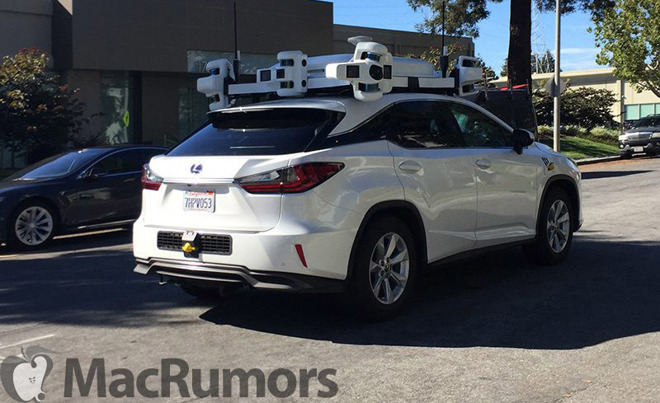 Spotted by a MacRumors reader, the vehicle is regularly seen parked outside of an Apple office in Sunnyvale, Calif.
Judging by the photos provided, the building in question appears to be part of Apple's "Project Titan" facility. AppleInsider in 2015 uncovered the location of tech giant's self-driving car initiative, where employees worked on everything from hardware engineering to software development. 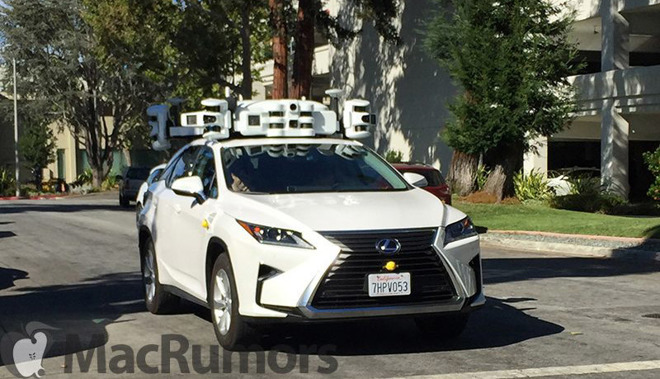 The vehicle seen in today's photoset is a 2016-2017 Lexus RX450h, a newer version of the SUV Apple has been using as part of its Autonomous Vehicle Tester (AVT) Program. In April, the company filed for, and was granted, a license to operate three 2015 Lexus RX450h SUVs for autonomous testing. Those cars were subsequently seen driving in Silicon Valley. Sitting atop the new SUVs is a highly advanced integrated sensor array that appears to be a next-generation version of equipment deployed on the original testbed. Instead of mounting LiDAR, GPS and radar hardware in separate locations, the new rig integrates necessary equipment into a relatively compact roof-mounted package. Though it is difficult to identify each component in the custom built housing, it appears Apple is using Velodyne's new Puck LiDAR sensor, a 16-channel unit capable of logging 300,000 points per second at a range of 100 meters. There seems to be 14 Pucks mounted around the car, four facing forward, two behind and two each at the corners. Camera lenses can also be seen in housings attached to the specialized roof rack, as well as a GPS antenna and radio communications equipment. Separated from the central sensor array are five yellow-capped sensors that could be compact radar arrays. Apple's older testbed featured radar sensors mounted at all four corners. Finally, a distance measuring apparatus similar to a surveyor's wheel is seen mounted to the SUV's left rear wheel. Apple's autonomous vehicle program is a continuation of efforts to build a branded self-driving car under the "Project Titan" initiative. At one point, Apple had over 1,000 employees working on various projects, but the effort hit a number of snags and was ultimately put on ice in late 2016. Initially led by former Apple executive Steve Zadesky, Project Titan was handed over to SVP of Hardware Engineering Dan Riccio and then to longtime executive Bob Mansfield. Under Mansfield, the team was whittled down and efforts refocused to self-driving software and supporting hardware. A report earlier this week claims Apple plans to put its self-driving technology on the road as part of an experimental autonomous shuttle. Dubbed the Palo Alto to Infinite Loop, or PAIL, the service will ferry Apple employees between the company's Silicon Valley campuses.